Remember how we said RAM prices probably wouldn't get much cheaper in the near future? Well, that was very wrong. Citing anonymous industry sources, DigiTimes reports today that Kingston has cut deals to sell its 2GB DDR3 modules for as cheap as $11 (yes, that's eleven bucks), and that move has prompted competing firms lower their prices as far as $10. By offering lower prices, DRAM manufacturers expect shipments to rise, but DigiTimes' sources believe the overall demand will remain weak. Based on DRAMeXchange's stats, contract prices have plunged more than 15% during July and that's expected to continue through August. Average contract prices for 2GB DDR3 modules fell 9.4% to $14.50 in the second half of this month while 4GB modules dipped a similar 9.7% to $28. At the same time, 1Gb and 2Gb chips were $0.75 and $1.59. Etail prices via Newegg are hovering around $25 to $30 for budget 2x2GB DDR3 1333MHz kits, while individual 2GB modules are between $15 and $20. Last Tuesday, iSuppli released a report claiming DRAM prices would continue to fall -- albeit increasingly slower. "Following a drop of 14.2% in the first quarter of 2011, the global average decline in pricing for DRAM slowed to 12% in the second quarter. The rate of decrease is expected to decline to 9% in the third quarter and then dwindle to just 4% in the fourth quarter. The rate of decrease will further slow to just 1% in the first quarter of 2012, and then remain in the 3 to 4% range during the rest of 2012." 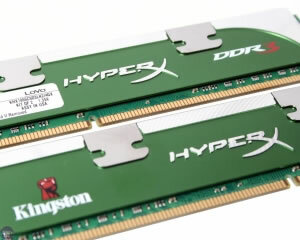 In a separate report released last month, the research firm said DDR4 DRAM would arrive in 2014 and rapidly eclipse DDR3 sales by 2015. Although DDR3 will remain relevant for at least a year or two following the launch of DDR4 modules, the newer technology is expected to represent some 56% of the market only one year after it hit shelves. That's a significantly faster adoption rate than witnessed with DDR3, which took two years to achieve 24% of the market and three years before it finally outgrew DDR2.